Part of a series of ongoing coverage on Venezuela. Part of a series of ongoing coverage on Venezuela following the death of President Hugo Chávez. On March 5, the day the Bolivarian Government of Venezuela announced the death of its president, Hugo Rafael Chávez Frías, the sky over the city of Mérida darkened into an uncharacteristic gray. The Andean sun, shining in the clear morning blue as it had been for the past three weeks, passed behind the clouds in the early afternoon and remained there through 5 p.m., when Vice President Nicolás Maduro made the announcement, choking back tears. At the institute for my study abroad program, we were told instantly to go home for fear of looting, riots, and problems with Americans. I decided to take a long route home through the city. Others, gathered in groups, exchanged words about the government's deception: how Chávez had likely been dead for some time and the vice president had only decided to make it official for strategic reasons. They made repeated references to Cuba and Fidel Castro. On the bus I caught to the city center, the Venezuelan national anthem abruptly interrupted blasting reggaeton music. In the seat across from me, a young woman fought back tears with the comfort of her boyfriend; behind me, two teenagers snickered. Suddenly, at a red light near the military battalion, a guard rushed over and handed our bus driver a folded piece of white paper, an order that we couldn't continue. While a line formed for people to pay their fare, about half the bus slipped out the back door. We were not told the reason for that order, but it became clear as I walked with the crowd towards the city center. Though it was just 20 minutes after Maduro's announcement, all schools and businesses had already closed down. Their owners dangled their keys as they walked away from their bar-enclosed storefronts in the opposite direction, joined by mothers tightly grasping their children. I had seen few police cars during my previous seven weeks in Mérida, but at least 10 now passed through the streets along with many motorcycles, some of them speeding through on the wrong side of the street. They all converged at the Plaza Bolívar, the heart of the city and the location of many chavista rallies in the spirit of the plaza's namesake. The most recent one, held 15 days before, had celebrated the president’s return from Cuba. Now, freshly-decorated murals hung by the grass, and along the sidewalk stretched a white piece of paper on which citizens had written personal messages to the fallen president. Some wished him peace and happiness, declaring that he would remain, with reference to his election campaign, the heart of the Venezuelan people; others professed their everlasting love. 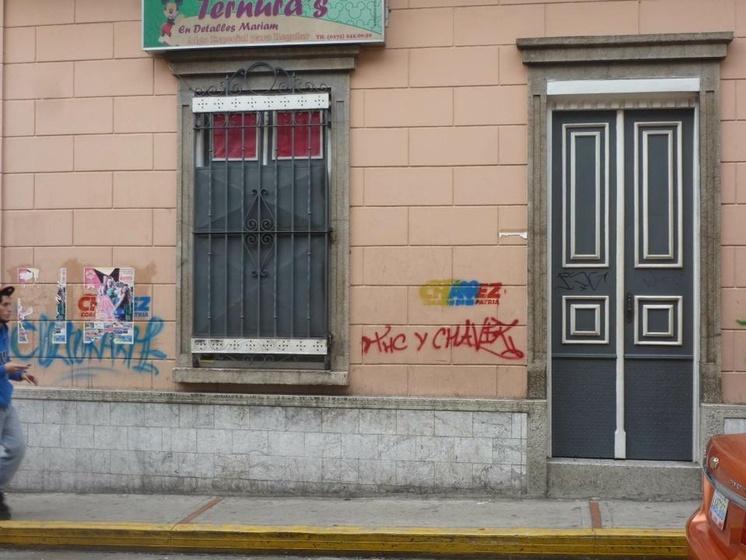 One person from the nearby city of El Vigía left a message consisting, mysteriously, only of a phone number. A stage had been erected in front of the city’s government building where six people spoke fervently to the somber crowd of about 500, clad in red. They led several popular chants emphasizing their identification with their leader (“todos somos Chávez”; “we are all Chávez”) and his continued presence, which would now remain in spirit (“¡uh! ¡ah! ¡Chávez no se va!”; “Chávez won't go!”). Then, in an appeal to overcome the tragedy, they called upon the collective unity that Chavez had fostered among the people. Behind them stood a line of police officers and paramedics, waiting at attention beside an ambulance. The leading speakers now shifted their rhetoric to “The Empire” of the “yanquis” (or yankees), rousing loud cheers. Considering my appearance and accent, I decided to head back home. It was an hour after Maduro's announcement, and the sky was fading to a mix of blues, greys, and black. Flashing police sirens illuminated the streets, which were now gridlocked with traffic. As an observer, I felt a distinct distance from the varied emotions of the passing citizens, their reactions of fear, relief, elation, grief, and indifference. But on another level I sensed a human connection: without having taken a set position on the events, my reaction tended to include a mix of all the others. I felt the profound relief of the majority of merideños that 84 days of uncertainty had finally ended. I felt the deep sadness of the chavistas of losing a man who, to many, had advocated for and awakened the poorer classes as never before. And I felt the non-partisan detachment of those who believed that this country is defined by more than its extremist politics. Beyond the death of Hugo Chávez and the barrage of historical and political questions he left behind, there remained the complexity of Venezuela and its people. When I got back home, the streets were empty; only dim streetlamps and houses in the distant mountains provided light. Mérida, a city typically filled at night by fireworks, music, and cars, settled into silence.